Bill O’Reilly is one of the most recognized and talked-about journalists of our time. With an unparalleled track record as an author and with the #1-rated Fox News show, The O’Reilly Factor, O’Reilly has become a veritable institution of political insight and keen advice. In Keep It Pithy, O’Reilly offers a classic collection of the most memorable writings from his bestselling books, and looks back at how his opinions and ideas have been proven right or wrong by the passage of time. With his trademark candor and no-nonsense approach, each chapter focuses on a core theme as it gathers O’Reilly’s thoughts on the most compelling issues of our time and provides readers an illuminating guide to the American cultural landscape. 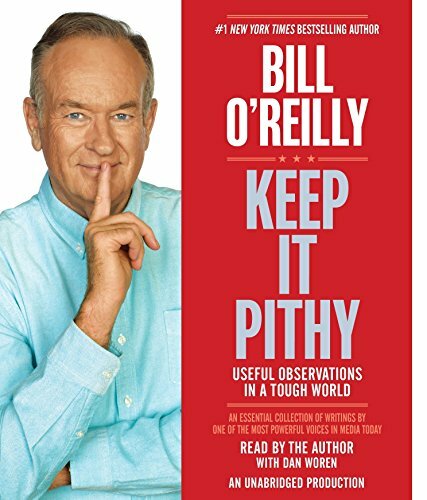 A spirited and personal book, Keep It Pithy is the perfect addition to an O’Reilly fan’s library, or the best introduction for the few left uninitiated.